A Skin Clinic in Durban that provides skin therapy and skin products. Electrolysis is one of the oldest methods of hair removal, yet for certain hair removal tasks, it remains the most effective. At Durban Cosmetic Laser Centre, it is most commonly used for smaller areas such as facial hair (chin, eyebrows, upper lip) where precision hair removal is required, or for hair removal where other methods aren’t as efficient, for example on hair lacking pigmentation. Hair completely lacking pigmentation can only be permanently removed by electrolysis. For larger areas, and areas where the hair contains high enough levels of melanin, we offer state of the art IPL and laser hair removal, giving the Durban Cosmetic Laser Centre customer the unique advantage of having a variety of solutions in one location. You can read about all our methods on our hair removal page. We are the longest running laser hair removal clinic in KZN, we use highly effective medical grade lasers, and our electrologists has over 30 years of hair removal experience. Contact us today to book your electrolysis session. If you are uncertain whether electrolysis or one of our other hair removal solutions is right for you, simply contact us with an explanation of your problem hair, or arrange a no obligation free consultation. Or read on to find out more about electrolysis. Electrolysis involves inserting a metal probe (needle) into the hair follicle to the dermal papilla (the base of the follicle). An electrical current is then discharged to cauterise the follicle, hopefully preventing re-growth. Each hair is probed individually and then removed using tweezers. The number of treatment sessions required varies with each patient. A treatment session can range from about 15 minutes to more than an hour depending on the area being treated. Many factors can influence the treatment schedule for each patient, for example, hair growth cycles, the amount and type of hair to be treated, previous use of temporary hair removal methods, heredity factors, hormone imbalance, medication and stress levels. Those patients that adhere to the recommended treatment schedule will usually accomplish their goal in about 1 year. However, some improvement should be observed within several months after beginning treatment. The majority of hairs treated will not regrow. The hairs that do regrow are likely to be the deep rooted course hairs. Due to the hair growth cycle, new hair as well as hairs emerging from a dormant phase will also require additional treatments to achieve your desired results. Unwanted hair can be removed from nearly all areas of the body with hair removal electrolysis. The most common areas are the hairline, eyebrows, cheeks, sideburn area, upper and lower lip, chin, throat, neck, breasts, underarms, stomach, bikini line, feet and toes. It is recommended that the inside of the ears and nose should not be treated. Also, seek medical advice to determine whether hair in a mole can be treated safely. Can women have electrolysis during pregnancy? Excessive hair growth can be caused by hormonal changes brought on by pregnancy. Therefore, medical advice should be sought from your doctor before beginning treatment. You must discontinue any short-term hair removal method for about a week before treatment. This is so that hairs can begin to re-emerge and more hairs will be effectivley removed on first treatment. A skin test should be performed to ensure that the patient is not allergic to the metal used in the probe. If you are taking medication you must check with your doctor that this is not going to react to the treatment. Is hair removal by electrolysis painful? Most patients experience a sensation equivalent to hairs being plucked out. This is uncomfortable but most do not consider this to be unbearable. It is very difficult to minimise this sensation as each hair is surrounded in the follicle by nerve endings. Warming the skin helps as it opens the pores, allowing easier access to the follicle. Also it is worth noting that some areas are more painful to treat than others. What methods do you offer? Electrolysis at Durban Cosmetic Laser Centre is performed using the galvanic method, thermolysis or ​the blend method, depending on the task. What can I expect after therapy? 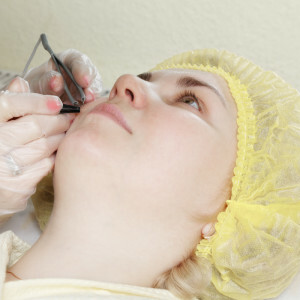 Immediately after a session of hair removal by electrolysis, the patient will note a tiny red lesion at each treated follicle, much like an insect bite. This lesion will soon disappear and the area will return to normal. Occasionally, small whiteheads or tiny scabs may appear. These small scabs are a part of the normal healing process and will not cause any long term damage if they are not picked off. If there is continued redness for several days or larger visible scabs, especially on the face, then let the practitioner know as soon as possible. This may be as a result of the patient being allergic to the metal used in the probe. Electrolysis has been practiced since 1875 and is statistically a very safe procedure to remove hair. The only known side effects are due to allergic reactions to the metal probe. However, the patient may notice some slight redness, swelling, or minor scabbing of the skin, which is only temporary. Contact us for a cost free, no obligation consultation. Comprehensive aesthetic treatments for both men and woman of all ages. The clinic combines a warm, comfortable and relaxing environment along with professional, friendly and confident service. Our objective is to establish and maintain a close personal relationship with our clients in order to provide the best possible treatment and advice. 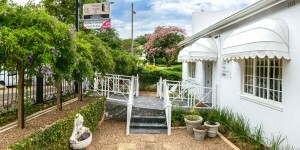 Durban Cosmetic Laser Centre is located at 461 Innes Road (Opposite Mitchell Park), Morningside, Durban. "Durban Costmetic Laser Centre has incredible service and advice - I highy recommend it!"